Hawk HPS get great reviews. Pagid RS4 are well regarded as well. PRY4SNO wrote: Hawk HPS get great reviews. Both of these are good options. I've used EBC stuff before and they bit pretty good too (Green or Red). Look for something more street/auto-x oriented than track oriented because you won't ever get a track pad up to a high enough temp to actually bite properly. I like Textars except the brake dust. I’ll probably try a ceramic and deal with the noise next time. Before I went to Porsche brakes I used CarboTech on both the front and rear. Low dust and upgraded pads. I used the 1521 pads for the street. I still use the same pads for the street on my upgraded brakes setup. This is a very helpful graph - make your pad choice based on useage. FFF wrote: This is a very helpful graph - make your pad choice based on useage. VW g60 and audi g60 use the same pad right? mr_aj_johnson wrote: VW g60 and audi g60 use the same pad right? That's a good question. Don't know why they would.be different. I just put on a set of hawk HPS pads with the stock calipers, and new vented steel rotors. I'll let you know how they feel after my last lapping day on the 8th oct. I was running on oem pads previously so there should be a noticable difference. I put EBC DP3711C "red stuff" ceramic pads on my car a few years ago and have been very happy with them. Braking action is very good, there's a lot less dust than other pads I've used, and I haven't had any of the problems you sometimes hear about with ceramic pads like squeaking. Considering that VWs never got the Girling G60s, no. You may be thinking of the brakes that came on a Corrado G60. They were Girling G54s. Doh! I always assumed the vws had a g60 brake option as their cant have been that many g60 corrados and google searches seem to bring more vw hits than audi lol. Lucky wrote: I just put on a set of hawk HPS pads with the stock calipers, and new vented steel rotors. I'll let you know how they feel after my last lapping day on the 8th oct. I was running on oem pads previously so there should be a noticable difference. elaw wrote: I put EBC DP3711C "red stuff" ceramic pads on my car a few years ago and have been very happy with them. Braking action is very good, there's a lot less dust than other pads I've used, and I haven't had any of the problems you sometimes hear about with ceramic pads like squeaking. That's good info, thanks! 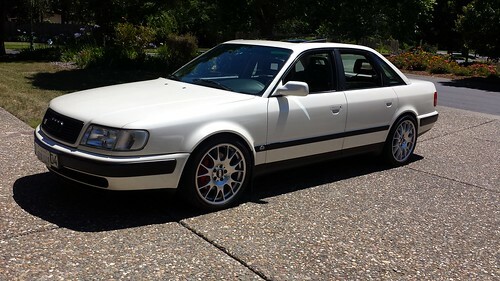 When I did Brembo rotors/pads on the Farmenwagen the ceramics definitely improved bite and dust over OEM but there is some squeaking from time to time, usually pulling up to a stop in traffic or drive-thru. They are a definite improvement over stock, they have better braking power. I found myself entering corners slower when using the same braking points. I didnt notice any fade during the last track day. With the stock pads after a few laps the fade was very noticeable. There is no brake squeal I have come across street or track. I cant report on brake dust though I dont have a lot of street run time on them. I followed the bed in procedure on the box and during the last stop there was noticeable fade I actually thought these aren't that great lol. After the ten minute cooldown they bit in and stopped hard I was impressed, there was no fade for me after the cooldown. For someone who regularly tracks or does time attack they would probably reach the fade point but for autocross, lapping days, or spirited driving I think they are a good pad.